A new development of contemporary villas each with a private swimming pool, expansive outdoor living area and private lush gardens. 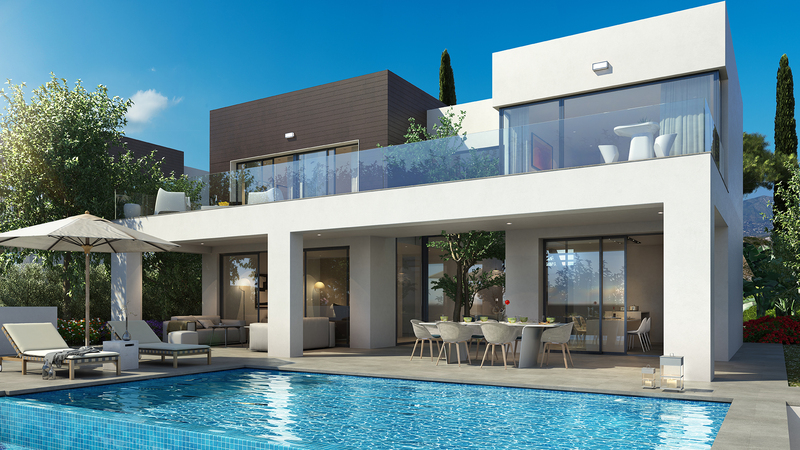 Comprising a gated and secure community, it is located between Fuengirola and the popular Mijas Pueblo; all homes will be positioned to take full advantage of uninterrupted mountain and southern views to the sea. The development is perfectly located to access all amenities that the Costa del Sol offers, only 15 minutes to both Malaga International airport and the bustle of Marbella and Puerto Banus. All private villas will be 3 and 4 bedrooms, 3 and ½ bathrooms, have open plan kitchens and lounges over two floors, with quality materials and fittings. Underfloor heating will be incorporated throughout lower and first floors. Basements will also be fitted out to full “living area” potential to cater for TV/chill out/kids play area with fully fitted bathroom and shower.